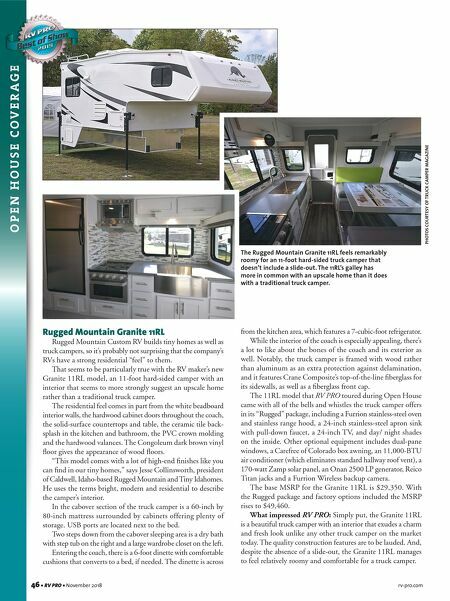 46 • RV PRO • November 2018 rv-pro.com O P E N H O U S E C O V E R A G E Rugged Mountain Granite 11RL Rugged Mountain Custom RV builds tiny homes as well as truck campers, so it's probably not surprising that the company's RVs have a strong residential "feel" to them. That seems to be particularly true with the RV maker's new Granite 11RL model, an 11-foot hard-sided camper with an interior that seems to more strongly suggest an upscale home rather than a traditional truck camper. The residential feel comes in part from the white beadboard interior walls, the hardwood cabinet doors throughout the coach, the solid-surface countertops and table, the ceramic tile back- splash in the kitchen and bathroom, the PVC crown molding and the hardwood valances. The Congoleum dark brown vinyl floor gives the appearance of wood floors. "This model comes with a lot of high-end finishes like you can find in our tiny homes," says Jesse Collinsworth, president of Caldwell, Idaho-based Rugged Mountain and Tiny Idahomes. He uses the terms bright, modern and residential to describe the camper's interior. In the cabover section of the truck camper is a 60-inch by 80-inch mattress surrounded by cabinets offering plenty of storage. USB ports are located next to the bed. Two steps down from the cabover sleeping area is a dry bath with step tub on the right and a large wardrobe closet on the left. Entering the coach, there is a 6-foot dinette with comfortable cushions that converts to a bed, if needed. The dinette is across from the kitchen area, which features a 7-cubic-foot refrigerator. While the interior of the coach is especially appealing, there's a lot to like about the bones of the coach and its exterior as well. Notably, the truck camper is framed with wood rather than aluminum as an extra protection against delamination, and it features Crane Composite's top-of-the-line fiberglass for its sidewalls, as well as a fiberglass front cap. The 11RL model that RV PRO toured during Open House came with all of the bells and whistles the truck camper offers in its "Rugged" package, including a Furrion stainless-steel oven and stainless range hood, a 24-inch stainless-steel apron sink with pull-down faucet, a 24-inch TV, and day/ night shades on the inside. Other optional equipment includes dual-pane windows, a Carefree of Colorado box awning, an 11,000-BTU air conditioner (which eliminates standard hallway roof vent), a 170-watt Zamp solar panel, an Onan 2500 LP generator, Reico Titan jacks and a Furrion Wireless backup camera. The base MSRP for the Granite 11RL is $29,350. With the Rugged package and factory options included the MSRP rises to $49,460. What impressed RV PRO: Simply put, the Granite 11RL is a beautiful truck camper with an interior that exudes a charm and fresh look unlike any other truck camper on the market today. 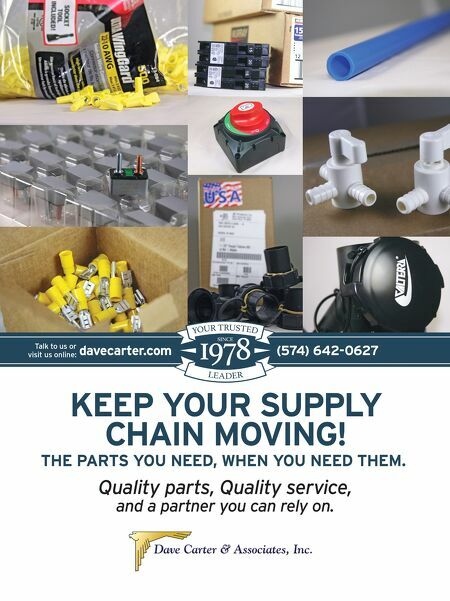 The quality construction features are to be lauded. And, despite the absence of a slide-out, the Granite 11RL manages to feel relatively roomy and comfortable for a truck camper. PHOTOS COURTESY OF TRUCK CAMPER MAGAZINE The Rugged Mountain Granite 11RL feels remarkably roomy for an 11-foot hard-sided truck camper that doesn't include a slide-out. The 11RL's galley has more in common with an upscale home than it does with a traditional truck camper.